Croatia star Luka Modric is like a little brother and undoubtedly the nation's greatest player, former team-mate Joey Didulica said. Modric, 32, has led his country into a first World Cup final, where France await in Moscow on Sunday. The Real Madrid midfielder has been touted as a potential World Cup Golden Ball and Ballon d'Or winner, having also helped the LaLiga giants to a third consecutive Champions League crown. Didulica, part of Croatia's 2006 World Cup squad alongside Modric, lauded the superstar. "He's a small man, but he's got big personality. He's a lovable kind of character," the former Ajax goalkeeper told Omnisport. "What makes him such a lovable character is his ability during a game, his work rate. He'll run for somebody else, he'll make a tackle for somebody else, and he trains hard, he's got respect off the field as well as on the field. "He's one of these characters that he's like your little brother. He's just adorable. You just want to hug him. He's there, he works so hard but he's got a big personality. He's very outspoken, but you look at him and you just want to hug him. He's a nice kid. "I remember when I was there, he was still young but he always used to talk about Ajax to me and [say], 'You're at Ajax, that's my dream sort of club, I love Ajax' and he was just asking a lot of questions. "He always stayed back after training and would shoot and ask, and ask politely, 'Do you want to go in goals?' or whatever. He was just really nice and everybody just flocked to him, they wanted to hang out with him." Didulica, who finished his career with four caps for Croatia, said no midfielder on the planet could argue they were better than Modric. 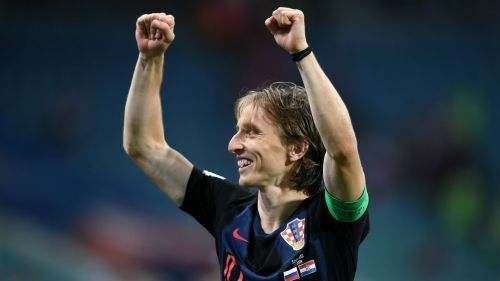 The former shot-stopper also believes Modric – a LaLiga, Copa del Rey, Supercopa de Espana (2) and Champions League (4) winner – is undoubtedly Croatia's greatest of all-time. "How can he not be? Not just this tournament, but three Champions Leagues in a row," Didulica said. "He's the most decorated for sure. He's won the most titles out of any Croatian player – domestically and also Champions League. "If he was to take home this, that would be something massive, on another scale."